Find the Free Floret Table Topper Pattern HERE! It was a stormy yucky weekend in Seattle…and I was sewing like the wind to get this done before our power went out. Luckily it didn’t go out, and this little table topper was the brightest part of my Saturday! Windham Fabrics sent me a bundle of a new collection called First Blush, to make something summery. First Blush by Ruby Red Designs comes to stores this month. It has happy, saturated colors and a couple great basics I love. The little tiny dot/flower basic print is perfection…especially in the white backgrounds. It measures 26″ square and you can make it in an hour or so. Especially if you are sewing like the wind! Isn’t that red check a perfect binding fabric??! Hi, Thank you for the clever table topper idea. I want you to know I also like your work and your writing has been an inspiration for me. I have checked out your Modern book many times from our public library too. I can hardly wait to see what else you create. Thanks also for the Pumpkin quilt. Thank you Anita what a sweet compliment!! Thank you! What a sweet compliment!!! 1st time visit to your web page. Nice layouts and beautiful fabrics! The pattern so adorable. Thanks for sharing. First Blush is such a sweet line of fabric, and the Floret Table Topper pattern is perfect for it! I love the fabrics and thanks for the nice pattern. Such a cute table topper. I am loving those pretty fabrics. Such a cute pattern. Shows off the adorable First Blush fabric perfectly! Thank you so much for sharing!!! Love the range of colors of First Blush! Waiting on my husband to have heart cath….great way to occupy my time. The fabric and tabletop per are sweet! Good luck to your husband Deanna!! The colors are rich and saturated in this new line and your pattern showcases them beautifully! Very pretty fabric – I can see some very girly quilts and bags if I am lucky enough to win! Very happy! This would make a cute little girl quilt. Thank you for the chance! Love the table topper! Thanks for the chance to win beautiful fabric. I can see how sewing this fabric on a gloomy day would be a great pick me up. Isn’t it bright and colorful and cheerful! ‘Love the fabric and the little quilt. Thank you for the chance in this giveaway. Such a fun and cheerful line. I love the colors. This table topper is so special. Love the fabrics – and yes, the binding is perfect. Thank you for this cute free pattern – I still need a wall hanging for the summer months – this is perfect. Beautiful fabric and beautiful table topper – love all your work. Thanks for the pattern. Adorable pattern! A perfect match for this fabric. Cute table topper! It really showcases those pretty prints. Love your table topper…can’t believe it took just an hour! Thanks for the pattern. Cute table topper, and fabrics. LOVE the check binding! So simple and yet so pretty! Love the pattern. I like that you chose the red check for the binding. Love this fabric and your pattern. I’m thinking of making a baby quilt using this pattern. Just increase the size by making additional blocks. Thanks for all your tutorials. The bundle is beautiful. Love the topper. This fabric is really cool! Love the table topper. Made a queen sized quilt out of that block once. So cute! Thanks for the giveaway! I love the bright colors! Your table topper is a great gift idea–thanks for the tutorial! I really like these prints with white background. The colors are bright and are the colors that I like to sew with. I’m keeping my fingers crossed that I win this, thank you in advance! Love your topper!! You chose great colors in it. I think I will have to make one too!! Such happy bright colors. I would enjoy using them. Beautiful fabric! The little table topper is great. I love the vintage look of this new fabric collection. These would make an adorable pinwheel quilt. Thanks for the giveaway. Love the little one holding the table topper! Love your table topper! Thanks for the pattern! The binding is just perfect! It reminds me of grandma’s table – she must have had red checks on her table. The pattern is cute…thanks for sharing with us. What a beautiful selection of fabric! The table topper would look so festive on my table. I need to finish the project I am making so I can start one. Thank you for the chance to win this. Really like the colors in this collection, as well as your pattern. Anything with bright colors……love it! Thanks for the pattern. What sweet fabrics. I could make a little girl’s quilt with these fabrics and your fun pattern. What a cute little quilt. I think I’ll be making this soon. Such a cute table topper. I can see this on my table for Spring. Love the fabrics you used. Thanks for the cutest giveaway. I am amazed at all you accomplish. You must never sleep or you are super organized or maybe both. Your pattern shows off this fabric to a T. Thanks for all you do–you are an inspiration. Thank you for the pattern! I make doll quilts for the Salvation Army Christmas store and this will be so cute as a doll quilt! The size is perfect too!!! What a fun and happy little quilt! I could see using those blocks to make a little girls first “big girl” quilt for her move from crib to bed. I love your little Floret quilt! This would be cute as a car seat or stroller quilt. Thanks so much for the free pattern! Thank you for the chance to win! Love this :). Love the fabric colors. Happy, happy quilt pattern. Great colors in this line of fabric. Thank you for the topper pattern and a great giveaway. Wow-so cute! It’s all about the cool fabric, simple pattern, size of quilt (small is always fun) and a good old stormy day to stay in and be warm with your family. I enjoy winter stormy days here in Alberta it’s nice to stay in and do the warm things, baking or sewing. The shoveling after for the fresh and exercise is alway fun wit your friends. Your quilt let made me smile this morning. Job well done. Oh, that blue! Almost a periwinkle. One of my favorites. Thanks for sharing the link to the table topper, can’t wait to give it a try. This fabric is so cute and thanks for sharing the pattern as well! Beautiful fabric. What beautiful things to make with it. Love those flowers in your tabletopper! Love your table topper – especially the stripes below! Tanks for sharing. What a sweet table topper, thanks for the free pattern…and thanks to the model with the striped pants holding it up! I’d love to win the fabric bundle, the colors are so cheerful and fun. Your table topper is so adorable. Thank you for the pattern and the chance to win the beautiful fabrics. I really love your table topper and I love that it is quick to make! The fabric is so happy! Cute topper, thanks for the inspiration! Loving this line! Love the table topper. Thanks for the pattern. Thank you so much for taking the time to write up the pattern for your cute table topper. Love the colours of the fabric. Such great colors! And thanks for the pattern. The topper will look perfect on my table. How cute and happy this is. Makes me think of spring. Great quilt, thank you so much for the free pattern! And thank you for the giveaway! This bundle is SO cute!!!! Those cheerful colors can chase away gray skies. The fabrics are so pretty, and the little model’s leggings are so well coordinated! Cute little table topper but even cuter little leggings under it!!! Lovely fabric and I really like the table topper. Thanks for the chance to win. These colors are lovely and are shown off beautifully by your table topper. Thanks for sharing! How generous of you to share this pattern with all of us, and it looks adorable in this fabric. Love the bright cheery colors and the table top! It would also make an adorable baby quilt! Thank you for the chance to win. I need a project where I can sew like the wind (lots of slow sewing here lately). This looks like the perfect pattern for that. I would dearly love these fabrics to play with! Thank you for the pattern! I’m going to make more blocks and make a baby blanket! This fabric is wonderful! Thank you. So cute! I love the pattern – I think a 3×3 layout would make a great baby quilt. Thanks for the giveaway! Sweet little quilt! Thanks for the pattern. I’ve been making table toppers a lot this year…this one is perfect for Spring! Thanks!! Your quilt is so cute and very summer like! The fabric is lovely, too! Visiting the Seattle area in three weeks—hope we have a day or two of the “dark and stormy” weather. Love the cozy times with grandchildren. Quilts are a part of that formula. Cute, cute! I love all of the ideas for this beautiful fabric in this blog hop. Your table topper is so fun for a quick gift! Thank you!! Thank you for sharing the pattern.Love the new collection! And I love using Aurofil thread for my own projects. This is a great design and the fabric is so nice! Thanks for sharing. There are so many great ideas on this hop that I don’t know where to start first! Thank you for sharing this lovely pattern, I’m new to quilting and this is something I would like to try. Gorgeous fabrics and a wonderful table topper! Better add it to my list of want-to-make. First Blush is a happy summer memory that makes me smile. It’s perfect for your pattern. That is really cute (and your little helper did a great job holding the quilt!) Thanks for the free pattern! So pretty. Great pattern. Thanks! Thank you for the free project! I love this tour it is so inspirational. I would love to win the fabric to make your table topper. I love the colors and designs. Love the gorgeous fabric line – just my favorite colors. Would make spring table topper for my daughter in Seattle! i love these fabrics and your topper is adorable. i think i may make enough blocks for a lap quilt. Perfect item for gift giving. TY for the pattern. I read about that wind the Pacific NW had. Lucky for you you kept your power. Your table topper is adorable. I might make one for my daughter. What happy looking fabric. It would make a bright quilt. That is very cute and those little striped legs made me smile. Very happy fabric. Great pattern, too! Hi Allison! 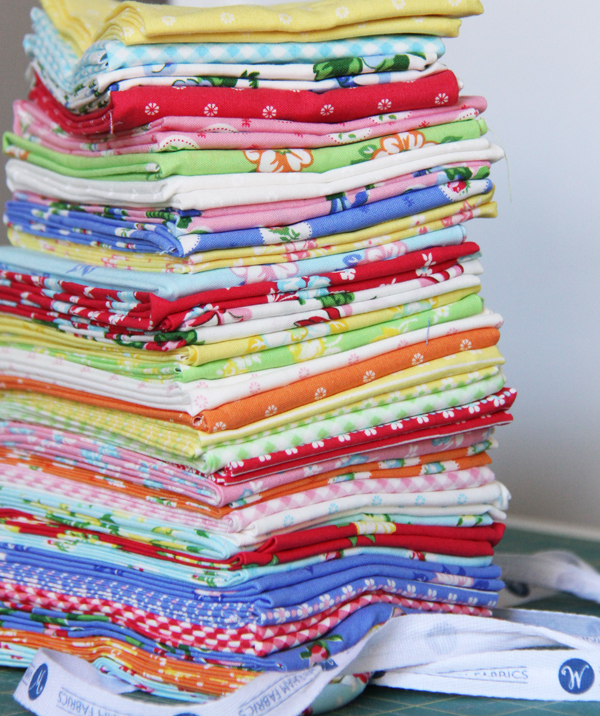 Thanks for the chance to win some cheery, blissful fabric!! Love the table topper you designed and I will definitely be giving it a try as I have a Christmas exchange coming up! Happy Stitching! Really nice pattern. It showcases the fabric beautifully. Thank you for the pattern. What a gorgeous bundle! And love your cute table topper, thanks for the pattern! That’s the perfect pattern for that fabric! Just darling! Thanks for the pattern and inspiration. So sweet. Thanks for the chance. I love this little table topper! Thanks for showing it off! I want to make one and the fabric you used just looks happpy! So fun! It definitely looks summery! Perfect pattern for those lovely prints. Thanks!! Love. Love. Love. Thanks for a chance! Love this table topper… so refreshing with its lovely prints. Would love to have this fabric! Thanks for the opportunity. This fabric screams Granddaughters! I can just see them wrapping up their dolls in a tiny quilt. 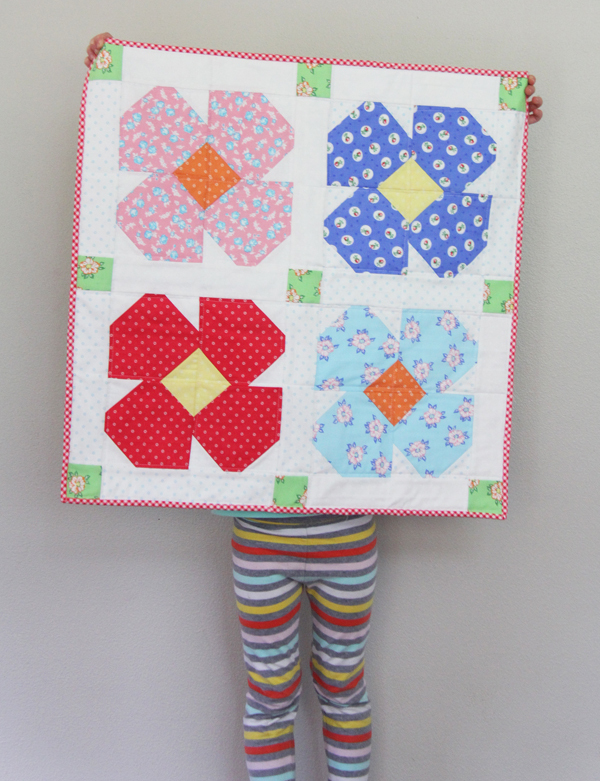 Love this little quilt and the fabrics! Looks like Spring! Thanks for the cute table topper pattern. Very versatile. This is a wonderful blog hop. These fabrics speak to my heart and I love their use in the table topper! They would fit so well in my guest bedroom or at our cabin! I love the little flower dots and the combination of prints. Such a cute pattern. I love the fabric! The colors are so yummy! Love the table topper pattern and the cheerful, bright fabric! Love the fabrics and the pattern! Thanks! Thanks for the pattern. This is a very summery fabric line. Such fun freshness in a table topper. I can see bright Fiestaware plates loaded with cookies, and a cup of tea to accompany them. The fabric speaks of get-togethers with friends. I’m sure yours will love your gift! Such a lovely table topper with fabulous fabrics! Thank you for sharing the pattern and the chance to win this great give away! Such a cheerful tablerunner. Perfect for a tea party. What beautiful colors and a beautiful topper. Thank you! You give me so much inspiration!! So adorable! 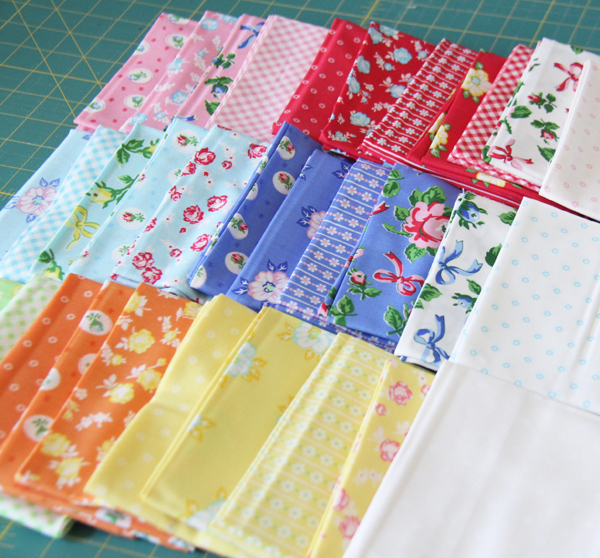 I love the sweet little flowers on fabric, and this bundle is full of them! Cute fabrics, and I love the table topper. It would make a great center for a baby quilt too. Love the colors, they just speak to my heart. Thanks so much for the pattern. It’s perfect for this fabric collection. Love the fabric, love the topper and absolutely love the babies crazy hair! Thanks for sharing and for the great inspiration. Your quilts are always so bright and happy. The dots, checks, and little flowers just make my heart sing. Beautiful fabric. Love your table topper. Rainy day sewing is the best. Love the bright fabrics. Very bright and cheery. Love the table topper – this would be great for my table in Easter colors! Your table topper is adorable! And the fabrics! Soo pretty! Thank you for sharing! Makes me want to start some spring projects even though we are having a bit of fall weather here in California–maybe I should make with fall colors?! Love the table topper and the fabrics! So pretty! Thank you for the pattern and the chance to win. Your table topper is so cute and cheery. Thank you for the pattern. Beautiful fabric! Love the table top pattern, too. What a cute topper! Thank you so much for sharing the pattern. Love your blog. It’s a fun color scheme. My daughter lost power twice but not for too awfully long. Love this fabric. It does look summery! CUTE TABLE TOPPER>THANKS FOR SHARING! I’ve made a posy block very similar to yours. It was fun and made a great quilt. Beautiful Fabric many great possibilities! I agree that that is the perfect binding fabric. Such pretty fabric, thanks for the pattern its so cute and thanks for the chance to win! 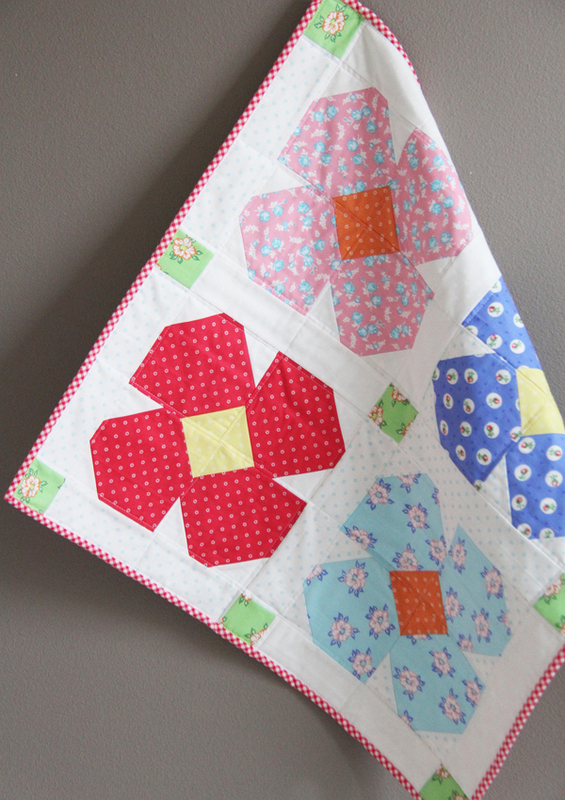 that flower block would make a beautiful (and easy) quilt for a little girl– or a big one! Very pretty colors! Im not good at putting fabric colors together, so I love buying it in bundles or jelly rolls or charms. Also, we live south of you and totally expected the power to go out. And for once..it didnt!! Love this sweet table topper! Such lovely fabric!! Yes, that dot flower print is darling, and the white dots are a great background print! That was my first Seattle rain storm, and it didn’t disappoint! Love the pattern and the fabric! Thanks for sharing! I totally love this. The fabric and the pattern. I think it would look as good in a quilt and I can’t wait to make one. Great idea! I love simple and quick projects. The red check fabric for the binding was perfect! your table topper is lovely. thanks for the pattern. i love the binding. CUTE cute fabrics, and design! That would be perfect in my 2 year old daughter’s room – so sweet! I love making table topper size quilts and this fabric is gorgeous! Cute fabric! Cute pattern! Thanks for the giveaway. Love the table topper, thanks for the pattern. I love the flowers and the fabrics too. Thanks for the giveaway. Thanks for the pattern. Love it! This is adorable. Thanks for the pattern! This fabric is precious and the pattern is adorable! Thanks for sharing your many talents! Love the roses! And is the darker blue a bit purple or is just my screen. Thanks for the giveaway! Love the cheerful colours, just what is needed on a gray and rainy day. OMG, that looks as if it is the beginning of a beautiful quilt. A bit of wonderful color to add to the fall, pre-winter days soon to come! I would love to have this bundle. Cute table topper. I think it really shows off the fabric. Beautiful fabric. Cute table topper. And who doesn’t love Aurifil thread? I know I do. What a cute quilt! I would love to win those neat fabrics! Gorgeous little project and fabric! These are beautiful fabrics and it would be so much fun to win! Then I could make the table topper. Thanks for the pattern for this cute table topper! Such a beautiful tabelrunner! The dots are the cutest. Such a cute little quilt! Lovely vintage floral fabric in super colours – the white backgrounds make them pop in your super pattern. Even your stripy pants little helper is a match! Love the colors of this collection. And the flowers in the table topper are cute! Thank you for the pattern and the opportunity to win! Love the fabric and table topper. I think I will make the table topper to add to my minis collection. Thank you so much for change at an awesome giveaway and the beautiful quilt pattern. Glad you didn’t lose power. Your table topper is beautiful! I am loving the table topper. It will be perfect in late winter when you can barely wait for spring crocus to poke their heads through the ground. Perfect with the fabric. Sew sweet! So bright and cute! Sweet table topper! The colors are amazing in this bundle! Love the new fabric line and your pattern. With all the pretty fabrics in the bundles they sent you, I don’t know how you managed to select the cute ones. I like that this is small and finishable and that it can be sized up for a baby quilt. Thanks for the pattern. I think my favorite part of the table runner is the checkered binding! Such an adorable table runner, love the checkered binding. Thanks for the pattern. So many possibilities with this line of fabric. I love your pattern with the fabrics! It really shows off the whimsical feel of the fabric line! Cute table topper and a great gifting project. Thanks!! I love the blue/purple shade, and the other colors make me long for summer. Love the fabric and the gingham binding is fab! Gorgeous! Would love to work with these prints. Love your pattern! This would make a great baby quilt! This is a great pattern. Thanks for sharing. What a great pattern and fabric line! I also love the striped leggings of your quilt model. I love the tabletopper. Thank you for the tutorial. The fabrics are perfect for making it. You did such a nice job. Your tabletopper is really cute, nice and bright for a spot of fall and winter color! Thank you for the opportunity to win First Blush and the thread…if I win, I can make my own with your pattern. Thanks again! Beautiful fabrics and an adorable table topper! Love the site and the fabric ! Love First Blush! Thanks for the cute pattern! That is a really cute topper! I think I’ll make one in fall colors right now. First blush reminds me of first crush. Its a fresh and young and wholesome feeling you get when looking at it. Classic design and color on the new fabric line. Also easy piecing on the topper. Love it. Your table topper is delightful! And that’s a cute pair of legs underneath it too. :) Thanks for sharing! Sewing like the wind….I like that! I also like table toppers and runners. They are a great way to test out a block or a few favorite fabrics and have a project done pronto! Like the wind! Beautiful pattern (thank you) and I especially like the checked binding you chose to add. First Blush is such a breath of fresh air. Perfect for springtime. Thank you for the table topper pattern. Just beautiful. Hoping that I am randomly picked!! Just my kind of fabric & a beautiful project. Thanks for the chance. Really lovely – you are so talented! What lovely vibrant fabric! Your table topper is beautiful! I’d love to try this pattern immediately!! Whether I win or not — definitely making this for my sister, Jeannie. For years we have labored together making baby clothes, curtains, and quilts. Four years ago Jeannie lost direct vision in her left eye — peripheral vision remains. Three weeks ago she experienced a detached retina. Our sewing days together are over. Jeannie will be thrilled with this beautiful table topper. Thank you for sharing the tutorial. You have a loving spirit! Love the bright, happy colors of this new fabric line. The table topper has me thinking of Mothers Day gifts. Never too early to get a jump on gift giving sewing! I know a new baby on the way and her parents are avid gardeners–perfect pattern (but I’ll make it with 9 blocks). Thank you so much. I’m picturing you sewing like the wind! I bet you are good at that! :) have to be with a baby in the house! cute topper. Thanks for the giveaway! I love this fabric and the table topper is too cute! Thank you! Love the fabric! So fresh and bright! LOVE the table topper FREE pattern. Sharing on Pinterest! Thank you! I’m a fabriholic who loves bright and happy, so I’m already crushing on First Blush just from your pictures! I also love the table topper you made to show it off. LOVE! LOVE! LOVE! Love the table topper you made! THANK YOU for such a pretty pattern! Adorable! As always. And a great size. :) Would love to win the stack. Downloaded the pattern :) It’s a keeper. I’m ready for some fresh fabrics! Ooh!! I really need to make a petal quilt soon!! So sweet!!! Love the prints! Love the fabric and the topper is adorable. Would make great pillow covers for the spring too! The colors and pattern are gorgeous! It is my sort of pattern and colors! Thank you so much! I love the fabric and the table topper. Its beautifully done! I am definitely going to be making this little cutie. Thank you for so much for sharing the pattern. The table topper is such a darling design. How you keep the fresh ideas coming so clearly and quickly is amazing in your busy household!! !Thank you for your inspiration. I love First Blush as it is both vintage and modern at once. It is timeless though and I can see this being a much loved collection. It’s a great little table topper, but I think my favorite part of the photo is the striped legs which stick out below it! So cute! Wow! What a cute pattern. Thanks for sharing! Adorable little table topper! Such a gorgeous, cheerful fabric line!! Generous giveaway and generous tutorial – thank Windham and thank you! I love the fabric and the fun table topper. Would be lovely to play with them in any number of projects. Love the bright cheery colors paired with the flowers! Great combo! Cold and rainy in Minnesota 😞! Could really use a picker-upper and this gorgeous fabric would do it for sure! Love the colors in this bundle!! I love reading your blog. Would love to win this fabric to make the table topper! That is such a cute little quilt. I love making small Quilts like that for my pets. I have a cat and a dog and each has about 5 Quilts of their own. But I find that we can never have to many. Great job and I really enjoy the fabric, especially the white on white dots. That would be a fantastic fabric to have on hand at any given time!!! Your pattern is so cute and perfect for the fabric collection. Sewing like the wind made a beautiful cute little quilt! Love it! Cute, cute quilt, so fresh and pretty!!! Really like the new fabric line. Love the new fabric, particularly the white, and the flower block is delightful.I know I will use it on a number of projects. I love the fabric and your table topper is adorable! Thank you for the pattern! Thank you for the free pattern and the chance to win this beautiful fabric line! It’s so cheerful. Love the First Blush fabrics, but really love your table topper pattern! Thanks! What a generous give-away — love this fabric! So bright and cheerful, just makes you smile! What a gorgeous pattern and quilt! I would like to make one with more flowers for a baby quilt. So sweet. Cute quilt and fabric! Thanks! What a cute quilt that would make! Love the colors, love the prints, but mostly love the ginghams! I always have to buy them! Very pretty pattern. These beautiful fabrics make me think of spring. Such pretty fabric. And the table topper is adorable!! I love First Blush because the fabric line has such happy colors!! Thank you for the table topper pattern which is perfect for gifts! Love the table topper! First Blush makes it perfect! I absolutely love this fabric–I just want to eat the colors! Thanks for the cute pattern Allison! I really love the fabric! Your pattern shows it off perfectly. Thanks for the pattern, it is now on my to do list! Love all your projects. The floret pattern really is so Spring- like. I’m curious about what backing you used. Thanks. These fabrics are lovely! Thank you for the pattern. It looks doable for a beginner. I love those big bright happy flowers! Great pattern for these pretty fabrics…thanks for sharing!!! We may be headed for winter here in Ohio, but that fabric and your pattern look like summer to me! Love the brightness of the fabrics…makes your quilt really pop. This design and prints would make a happy quilt for a little girl! May have to put it on my list. Thank you for the free pattern, also such beautiful fabrics! I love making table toppers for friends and family. Thanks for the free pattern. Love your choice of binding – I think binding is key! Oh that binding! Great summery prints too. Thanks! Nothing better than a free pattern …oh, wait…free fabric! Love the pattern and your results! Thanks for sharing! What a cute pattern. I’m going to make it as a wall hanging for my great niece. The fabric line is a perfect choice for this pattern. Thank you for sharing. Such happy colors! They would definitely cheer up the gloomy day we’re having here in upstate NY. I love this fabric line and pattern. Thanks so much for sharing it! Your table topper is really cute. If it was made a little bigger, it would be a darling baby quilt! Thanks! That’s sch a fun table topper! Good for you for “sewing like wind” to keep ahead of potential power outages. I’m on the east coast and lost power for over a day with residual affects of Matthew. No sewing for me, but there was lots of wind! Those are beautiful fabrics, and I especially like the small flower prints that look in the photo almost like dots. So very sweet! Delightful pattern, thanks for sharing that!! I am definitely going to make this! Looks like a quick and easy project! Thank you. What a great way to keep flowers on the table even when there is nothing in bloom in the garden! Love it and the fabrics.! I love Windham fabric. Today’s featured pattern is a cute quick pattern. Beautiful fabric line and a great free project pattern. I want to download and make this topper. Gorgeous fabric so cheerful. The table topper would be great for Christmas gifts! I love the pattern and the beautiful colors! Great job! I love Windham fabric – so cheerful.. Thank you for sharing your pattern. Thank you for sharing the pattern, and the chance to win the beautiful fabrics! That bundle is to die for. Thank you for a chance to win it and thank you for the tutorial. I agree the red check made a wonderful binding. Thank you for the chance to win and the tutorial. You’re right: the fabrics are wonderfully happy and lovely. I’d love a chance to win these fabrics; thanks to you and to Windham for offering them! How adorable! I now want a table topper of happy flowers. Love the flowers!! Nice for a spring wall hanging. Thanks for the chance to win. Beautiful fabric and such a cheerful pattern. Love it!!! Such cute fabrics. Thanks for the chance to win. I can’t wait to start this project! Great fabrics! This would make a great gift! Your blog is my window into the quilting world. I’m always amazed at the beautiful collections of fabric, and Windham has done it again. So beautiful! Because of financial reasons, I quilt with bed sheets I find on thrift, and one day, I’m hoping to find something bright and cheery like this! What a great pattern! So many possibilities…..tabletop per, tablerunner, placemats. I think I could spend a week with my friend creating so many things with this pattern and the First Blush fabrics! Love this collection. Thanks for such a generous giveaway!! I love the pattern and these fabrics! Thank you for the free pattern, and I would love to win this bundle! Just too sweet for words. Love your binding choice. Love the table topper you made. It is too cute!!! Love the fabric. These sweet fabrics make me crave spring and it is hardly even fall yet! Pretty table topper and the fabrics are beautiful – You can never have too much fabric!! Love your work! I would have enjoyed seeing the little girl in the striped pants peeking around the edge of the quilt! Love your checked binding. Great idea!! The colors in this collection are amazing. That blue is especially nice. This fabric is cute to the 100th power! What a fun pattern! Thanks so very much. Love the new fabric. Reminds me of retro colors and prints and I love retro! Such a cheerful set of fabric! Your topper looks so happy! Such a fun pattern with happy fabric! This is adorable, Allison!! And if you added another flower row and maybe another border, it would make a darling baby quilt!! Love it!! First Blush is perfect to get one through the winter months in anticipation of spring! I love the fabric. And I all ways sew with Aurifil thread. Love the free pattern. Nancy P.
Thanks for sharing such a cute pattern with us! What a cute pattern! And the fabric goes with it perfectly. Your quilt holder is quite professional. I’ve been following you since before she was born, and now she’s the BIG sister….lol. Thanks for the chance to win. Love this fabric line and your cute floral pattern. Pick Me! I love Little Ruby would like to finish my Little Girl quilt with it! I would call this Happy Fabric. Love the colors. Such “happy “fabric! Love the red check for the binding. Thanks for the chance to win. What lovely, bright colours… crisp and refreshing to look at. Thank you for sharing your pattern and for the inspiration. Good morning! Thank you for the pattern and for the chance to win fabric! Great fabric and cute pattern! Love, love, love all of your quilts!!! Cute! Love the fabric & thanks for the chance to win! Love the fabric and pattern! I love that fabric!!!! I hope I win! Oh my gosh, those fabrics and colors make me feel so happy!! Love the First Blush line of fabrics. So cherry and fun! The table topper pattern is cute as can be and perfect use of the fabric! Found myself smiling the instant I opened this email! Wondering if I can make them in time for Christmas for my 6 sisters. Makes my heart so happy! Thanks so much for the free table topper pattern! It is exactly what I have been looking for on my round coffee table. I can’t wait to make it! I just finished your pumpkins quilt and have it hanging over the stair railing of my catwalk. It makes a lovely fall decoration! The fabric is just lovely and would be perfect! Great tutorial! I need to make some table toppers!! That is so cute Allison! You never cease to amaze. Love the fabric especially the dots. Thank you for the cute pattern! Even the striped legs match the quilt! Love those fabrics and your pattern! Love the pattern; thanks for sharing! The stripey pants totally made my day! Love the fabrics; so bright and fun. The pattern is perfect for the prints. Awesome fabric and such a cute table topper pattern. Thanks! Beautiful pattern and colors. You are very talented! Such fun fabric. And the quilt is adorable! Love the fabric & your tabletopper! Thank you! I love everything about this! The fabric collection is fresh and fun, and the topper is cheerful and cute! I need to make one for my porch table in the winter to remind me of the sun! The striped PJs on the model are cute, too! Love the binding. I am going to have to find some of that. I would love to win the bundle. What beautiful fabric!!! I would love to win and make something beautiful! I love the happy and cheerful prints! I love these fabrics. They remind me of the 30s repro fabrics and I can’t get enough of them! Thanks for the giveaway and the free pattern. helen g.
I love your quilt, especially the red check binding. Thanks! I love the table topper! That will be a perfect Christmas gift for my mom. :) Super cute fabric, too! I know what you mean about the wind. I live just SE of Portland and was quite thankful to still have the lights on when it was all over. Thank you for the pattern, it is adorable! These fabrics are scrumptious too. So cheerful! The colors are so refreshing! I truly enjoy following Cluck, cluck, Sew! Love the colors and wide variety of patterns in this bundle. Would love to have the opportunity to dig in to them. Love your Floret table topper-best of all is the pattern so I can try to replicate something like it. New to quilting and this is a perfect fabric GIVEAWAY to create a small stash. I understand that every quilter needs one!!! I would love to receive the bundle of fabrics. I am on a fixed income and have not been able to buy any new fabrics for a couple of years now. Love the variety. 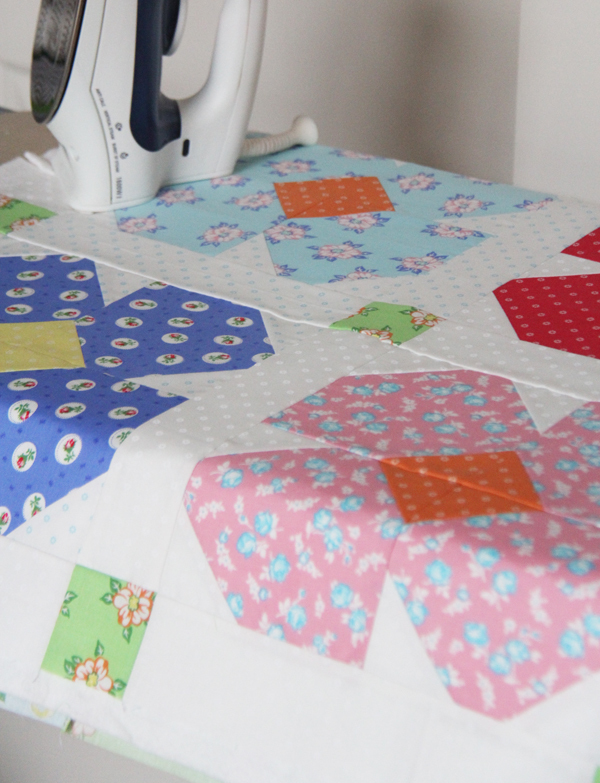 I’m loving your new Florette topper…bet I could make the *cutest* baby quilt by adding a few more blocks! The fabric bundle is deee-lish! What a giveaway! Fabric and thread – what could be better? Don’t thinks I’ve commented yet. That is an adorable little quilt. Thanks for the pattern. A great fabric DIL gifts! Love the orange & greens. What pretty fun colors! I would love to play around with some new designs. I love the fabric! Thanks for a chance to win! Super fabrics, would love to use them in my to do list. I am always on the look out for table topper pattern, thanks and thanks for the chance to win. Love the pattern! I think it makes a cheery baby quilt, too. All those pretty bright colours, and a table topper perfect for spring. Thank you. Beautiful quilt! I love how happy the colors are. Nicely done. Love it! So bright and uplifting! Cute pattern! Looks quick and easy too! Win, win, win! Fun table runner and nice to have a helpful helper! These poseys have gone to the top of my todo list. I love your little quilt especially the checked binding. Beautiful table runner with gorgeous fabric! Super fun mini! What a fun weekend project, thanks for the free instruction! I love these fabrics, and your table topper is so pretty! Thanks for this, Allison! I do love the red and white binding. Thanks for the free pattern. I’ll definitely be putting on my to do list. Such a happy table topper. I love it. Love the combination of these fabrics! Love the fabric. The table topper is very cute. Would definitely make that. So cute – and especially the binding! Thanks for the chance to win fabric! Oooh, I would love a chance to win these – thanks so much! And, what a sweet pattern! Thanks for a chance to win some beautiful fabric. I was just asked to make a quilt for a friend’s granddaughter, expected to arrive late November. First Blush would be perfect! This is super sweet! Thanks for the opportunity!! Beautiful tabletopper and First Blush is perfect! I love this!! The fabric and the pattern…it would make it feel like summer all dreary winter long!!! What an awesome giveaway! Thank you for the free pattern. I love the pops of red in the First Blush collection. Thanks for a chance to win and the adorable pattern. I cannot wait to give it a try. Thank you for sharing your talents! What a cute way to use up pretty scraps in many color combinations. So cute. We had a lot of family batting down the hatches. Glad you didn’t lose electricity! This is such a cute pattern for the beautiful fresh spring fabric! Allison-That table topper would also make a great baby quilt. My daughter is expecting in May and it would be perfect, especially if I was lucky enough to win a fat quarter bundle. What fun fabric! I like the quick and easy quilt pattern! Thank you for the opportunity! Love the colors of the flowers and the binding. Thank yoi for the pattern and how to do this! Thanks for the awesome pattern, love your little helpful, would love to win the fat quarter bundle and the aurifil thread, just converted to aurifil and love it never going back to anyother thread. Love this bright new fabric. I also think if a couple borders were added, this would be a really cute quilt for a baby girl. Thanks for the chance to win. Those fabrics are so clean and fresh looking, love the colors. And who doesn’t love Aurifil thread! Talk about happy colors, you nailed it!! Thx also for the table topper pattern!! Such cheerful colors. Aurifil is the best! Great giveaway. Very pretty fabric and project! Thanks for the chance to win! I am going to print out the pattern and make this! Thanks for sharing your mad skills, Allison. I love this quick and easy pattern! Perfect for a gift! Thank you for the chance to win. Thanks for the inspiring pattern…it really sets of the fabrics sweetly. I love what I’ve been seeing throughout this for n black g hop. Cute pattern and cute fabric! Your topper is so sweet. Those fabrics have a wonderful vintage look. Beautiful fabric and your topper is so cute! Who doesn’t love the fabric and Aurifil’s thread. Definitely need to make this topper!! Sweet!!! You are so inspiring. Everything you do makes me smile! Thank you for the great pattern. It is just what I was looking for. Beautiful fabric. Love, love, love the fabric and the pattern! Love this cute pattern! Fabric is darling, too. Love your pattern and table topper!! Such a nice fat quarter bundle!!! What a happy topper! As winter approaches, the fabrics are just the answer to blustery days! Windham Fabrics is giving away a full fat quarter bundle of First Blush!! Tooooo Cooooool I hope it’s because I love their colors!! Please sign me up. Also, YES I love the Red Check fabric you used on the back. :) Thank you for the contest & Good Luck Everyone. I’m in love with the colors and patterns of this line of fabric. And your table topper makes me look forward to spring! Love the fabric! So awesome! Beautiful colors! I love the table topper. I might make several as gifts! Such a cute tutorial. I’m definitely going to have to make this now! And thank you Windham Fabrics for doing a giveaway! I would love to put that FQ bundle to good use! Love the reds in First Blush. Beautiful colors and I love the the table topper! Thanks! I’ve had this collection on my wishlist for quite some time, so pretty!!! These fabrics make me happy! Thank you for offering this giveaway. You make it look so fun and fresh every time!!! You have such a gift for “preset”! Love the fabric. . .Love the pattern. As a Floridian, summer never really leaves. So this cute little pattern and fabric would be right at home all year! What a lovely line of fabrics! Thank you for the opportunity ………love gingham and dots……I cannot lie ! Love the fabric and pattern. My granddaughters would love a quilt made from the pattern and colorful fabric. Love the pattern! So pretty and fresh looking. The fabric is so cheerful. I think the block would make a great baby quilt, too. Love love love this table topper! 1 week of fall and I’m already dreaming of Spring! Thanks for the free table topper pattern! Your table topper is cute! Thanks for the chance to win this lovely First Blush Bundle. I really enjoyed the story with the table topper. This fabric collection is definitely one I’d pick for myself. Thank you for the pattern. I am making seasonal table toppers and runners for my sister for Christmas. Those are the cutest fabrics and table topper!! I especially love the red binding fabric! I have been looking for a design to do that will show the fabrics off and this is perfect. .. thankyou and I know I am going to enjoy making the table topper. Lovely topper and lovely fabric!! I do NEED a tabletopper and this is so cute! Thanks for the pattern, I think I MUST make this. SO so cute! Love the topper too! I love the table topper and how bright the colors are in the fabric! Nice way to make a really pretty and simple flower block. Thanks for sharing ! Such a lovely table topper! Thank you for sharing the pattern and the opportunity to win the fabrics to make it! Have a fantastic creative day! Love the table topper! The fabric is adorable! A whole lot of cute right there! I’ve always loved flowers and this is a very clever way (pattern) to make the shape! Such cute fabrics….I know just where to put my topper..Love these colors..
Beautiful prints. Nice design too. Thanks for the giveaway. Love the fabric – I’m a huge fan of periwinkle. And I’m definitely going to make the topper. Thanks for sharing! Love the colors- soft, but bright. Love your project but it will take several hours for me! I love the colors and various prints in this line. So happy! thanks for the free pattern – I’ve already downloaded it! from when I was a child. I agree, the red print is a perfect binding! eeep such an adorable table topper and those little dots and the gingham are so fabulous ! These fabrics are so cute! Thanks for the giveaway! Your quilt is such a happy one. Absolutely lovely & cheerful quilt! Thank you for taking the time to making and sharing it! Thank you for the opportunity to win either the First Blush fabric OR the Aurifil thread! And, thank you for the pattern for your cheerful table topper! Love this fabric, and pattern! Thanks for sharing! Lovely! Cheery fabric, cute pattern! Such happy fabric! Especially for a rainy day like we had here today. I love the fresh fabrics and the large scale pattern! I just finished the pumpkin quilt and made a matching pillow. Can’t wait until it arrives back from the quilter. Love the flowers and yes, the red check binding is perfect! The table topper is adorable. As is the fabric. I am really smitten with the blue with the large pink roses (at least I think that’s what they are.) Thanks for your generosity. Love love love this pattern and the fabric is just me!!! Love this bright, cheery fabric line!! Beautiful flowers that won’t fade! What a beautiful table topper. Thanks for the pattern! Very Simple But I Like it………..
Over here! Pick me, pick me! 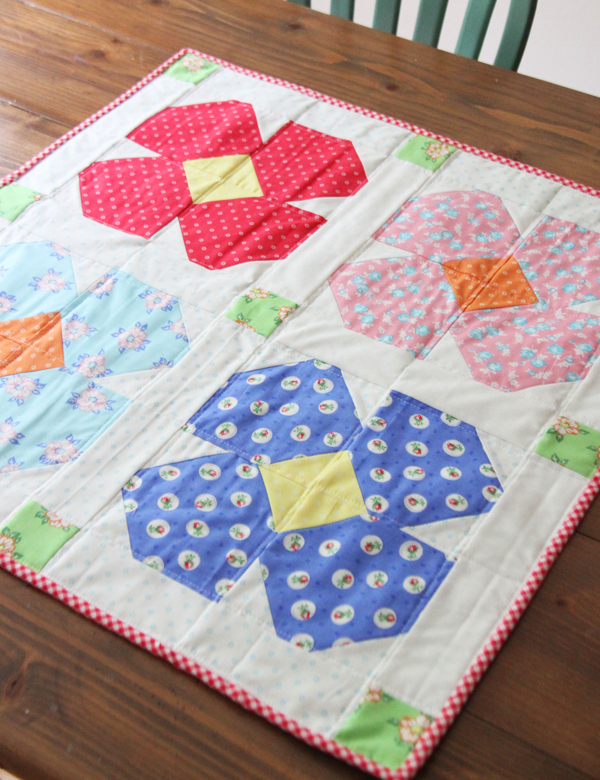 I love reading your blog and your quilts are so cheerful. I could use a box of sunshine down here in Camas! Thank you for the pattern. This little quilt is adorable, especially in those fabrics! There are some awesome prints in this fabric bundle. The table topper is fab and I love the ginghsm binding. Hi Allison, I have been thinking about making a table topper for a child’s table off and on for the past month. I always look forward to your newsletter to see what is new in fabric and patterns. It seems like every month I just have to have something from cluckclucksew.com. which is one of my favorite browsing sites. Now I am enticed by “First Blush” a full fat quarter bundle giveaway plus a small Aurifil thread box. Plus a pattern for making a table topper! It couldn’t get any better than that! Oh yes it could as the pattern, which is named “Floret Table Topper” is free!! I love the fabric bundle, the colors fall into each other beautifully and I like the variety of sizes of the print within the fabric. I have never been very creative in developing my own patterns so I have boughten many patterns in the past. Now I am able to see how I can add to a pattern or otherwise change something in it. So I guess I do have some creative juices after all. It takes practice and a lot of time to find a niche that fits into what and where my happy place in life is. Thank you for being a part of that journey. Love this topper, it would make a great baby quilt. Yes, I’d like to win this one! I love the table topper pattern, but I think it would make a great quilt for a twin bed. Can’t you picture this in cars, or floral, or even polka dots? I can. Love this pattern and fabric. I love flowers no matter the season. They make me happy. Thank You so much for the free pattern. Such pretty fabrics and a fun table topper design. Thanks for the pattern and chance to win. Love the bright fabric. Perfect thing to work with on when it is rainy and stormy! The table topper is gorgeous! Thank you so much for the free pattern. Love the cheery table topper! Such happy fabric! Thanks for the pattern. I love the background fabric as much as the adorable prints! The lucky winner is going to deliriously happy! Love the sunny colors! Perfect fabric to brighten these dreary, wet days! LOVE this topper.. I’ll be making it as a wall hanging for my granddaughter. Thanks to Windham for the opportunity to win this lovely bundle! Thanks for the pattern and a chance to win a prize! I’m loving the red and orange with the small circles, but the purples are calling to me! Such a pretty line of fabric and fabulous project!! Exceptional line of cheery fabrics! I’d love to add them to my stash! Cute little quilt and First Blush is so pretty! 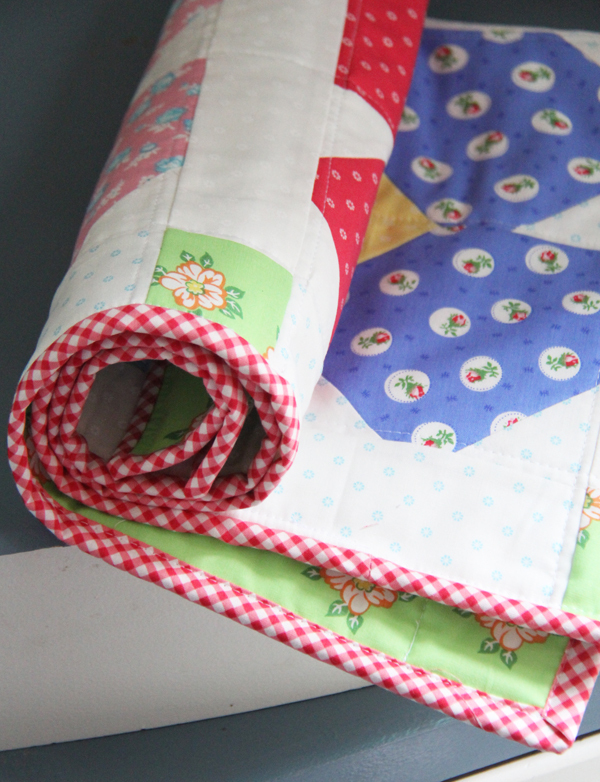 Love the rainy weather and quilting – they just go together! Thanks for the chance to win some lovely fabric! I love quick projects. Thank you so much for the inspiration. Your table topper is lovely. I too weathered the storm, just South of Seattle, and would have loved, loved, loved to have pieced together a quilt using First Blush material. Sweet table topper, I’m a simplicity lover. Lover this fabric too. Thank you for this beautiful pattern! I love your table topper in the First Blush fabrics! Absolutely love it! I am 14 and live to sew and quilt! Love this fabric!! That’s a cute table topper and the colours and prints in this collection are perfect!!! Very pretty. They remind me of pinwheels. I think it is very pretty. I have to agree that the red check makes it pop. Love that red check- this line is full of lovely prints and the color range is amazing! I love this table topper! It’s adorable! Thanks for the chance to win!!! I love your floral pattern! Love your table topper. I would love to enlarge it into a quilt for my year old niece. The colors in this line are awesome. Thanks for the pattern. I love the fabric!!! Beautiful! I love the warm tones and variety of colors. Thanks for the awesome pattern too! Bright and fresh! Wow, you can whip this out in about an hour? I wish I could work that fast! Looks like it would make a nifty little baby quilt. Love the colors and would love to win! I love these fabrics! Your table topper is very cute. Thank you for the pattern and giveaway. Thank you for sharing the pattern! I’m thinking of how sweet it would be for a baby quilt. The fabric selection is darling and I love the table topper too. Please enter me in the drawing. That fabric made such cute florets! I have a pattern that is similar that is called posies. Too cute! Thanks for the giveaway! Such pretty fabric & a very cute pattern! Thanks for sharing with us. Love the fabric, the table topper, and give away. Thanks for the pattern. Love, love, love this fabric! And of course the table topper, want to get started on one right away! Thank you for the pattern! Oh my goodness!! I love the fabric and this sweet pattern. Simply adorable! !